If you have purchased a copy of the revised edition Guide to Idaho Paddling, we have free downloadable map booklets for you. 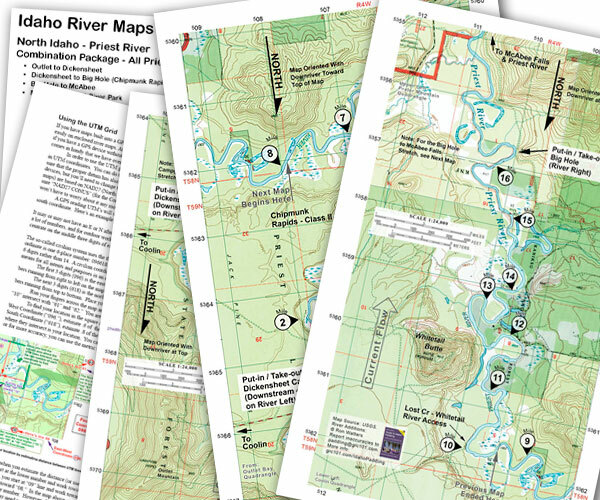 They are high resolution PDF's of detailed river maps created from 7.5 minute USGS maps. 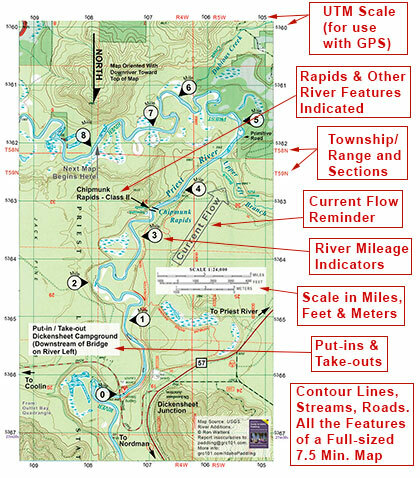 Included is a vicinity map (useful for driving to put-in & take-out locations), river notes, and other helpful information. The maps are legal size and can be printed on a color home printer or at a photocopy/office supply store. All in all, it's an nice package that you can slip in a map case or ziplock bag and take on the river with you. Below is a sample of what they look like. To access the booklets, you'll need a log-in name and a password. We'll give you that information in a second. First, a quick explanation of the password. The password is the first word that you find on a designated page in the book plus the following: #656. Note that the following PDF's are high resolution for printing purposes and are 15 to 30 megabytes in size. You'll need to give it some time to download.